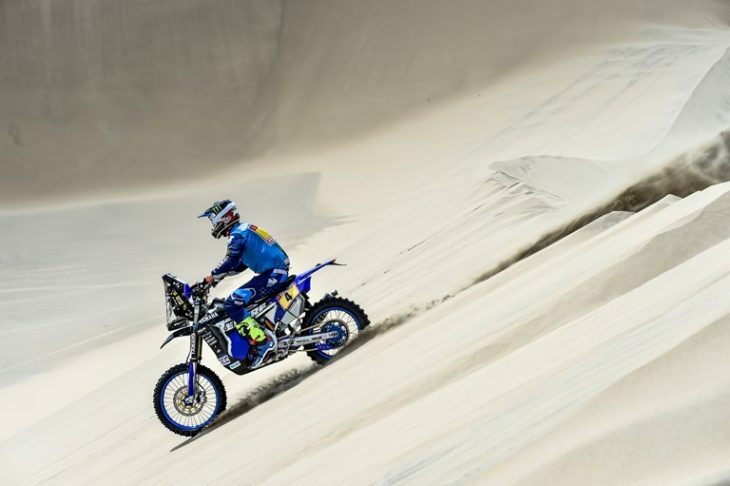 Enjoying a highly positive start to the 2018 Dakar Rally, the Yamalube Yamaha Official Rally Team saw three of its riders finish inside the top seven in the provisional overall standings. Headlining the team’s efforts in this short opening stage, Adrien Van Beveren was second with his teammates Xavier de Soultrait and Franco Caimi securing fifth and seventh respectively. Reaching the finish of the stage without any issues, Rodney Faggotter posted the 25th fastest time. Taking competitors away from the busy streets of Lima and towards the Peruvian dunes, the opening stage of this year’s Dakar Rally featured a short but demanding 31km-long timed special. Attacking the special stage from its very start, Adrien Van Beveren remained fast and mistake-free to eventually post the second-best time for the day. Placing himself in the runner-up spot in the provisional overall standings, the Frenchman is hoping for an equally strong performance tomorrow. Enjoying a great feeling aboard his WR450F Rally machine, Adrien’s teammate Xavier de Soultrait wrapped up the first stage of this year’s Dakar with a solid fifth place result. Remaining focused on his navigation, the Frenchman proved fast throughout the day and is now looking forward to the race’s first long stage tomorrow. For Yamalube Yamaha Official Rally Team’s Franco Caimi, this short opening stage was the perfect opportunity to shake away pre-race anticipation. Making a positive start, the Argentinean finds himself seventh in the provisional overall standings, one-minute and 31 seconds behind the provisional overall leader. Taking his time to settle in, Rodney Faggotter brought his Yamaha to the finish of today’s stage in 25th position. Feeling good in the warm temperatures of the Peruvian countryside, the Aussie is looking to continue building on his speed during the coming stages. Tomorrow’s stage two of the 2018 Dakar Rally features a circular route that starts and finishes in the city of Pisco. Including a short liaison section of just 12km, stage two will see competitors race a 267km-long timed special in sandy conditions. It will be the first of many difficult stages in this big adventure towards the finish line of the 2018 Dakar Rally.